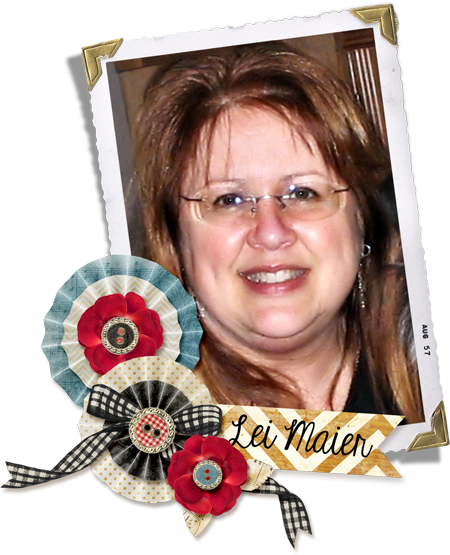 Join Creative Team Member Lei Maier as she shows you how to create clever crisscross cards using your digital scrapbooking supplies plus traditional craft supplies! Step 1 – I started by opening up an 8.5 x 11 inch document in my image editing program (Photoshop) and fill with your background paper of choice. In my case, I used Brandy Murry’s Petals Collection Biggie, printing Damask paper on one side and Washed Jade on the other side of cardstock. I printed 2 sheets; one will be the base of your card and the second used for matting. Step 2 –I opened another document measuring 5.25 x 3.75 inches and resized Brandy’s Petals Floral paper, positioning until I was happy and adding my inside sentiment for my card. 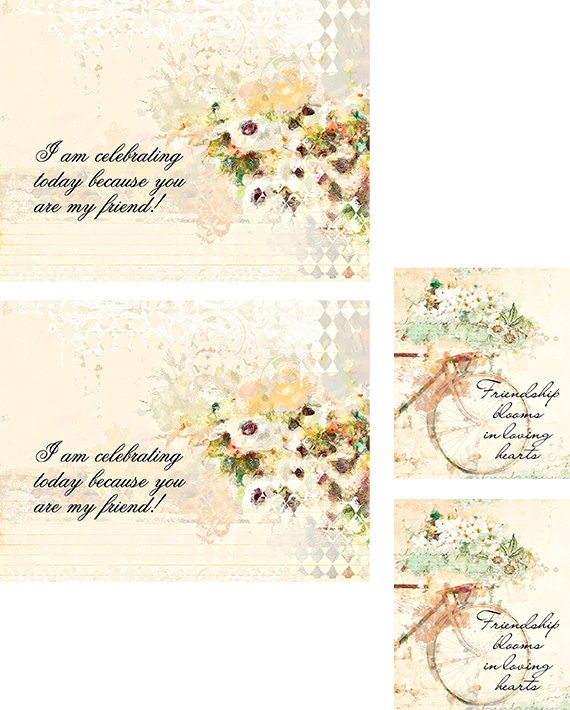 Step 3 – I then opened a document measuring 2.5 x 3 inches resizing Petals Bike and adding the front card sentiment “Friendship blooms in loving hearts”. 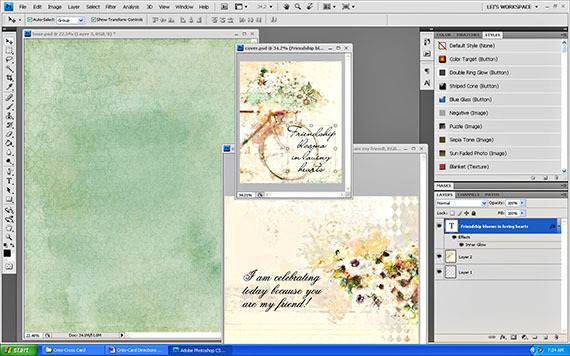 For the inside and outside sentiment I created a “print sheet” or printable and printed on watercolor paper. I try to take advantage of my print space and typically work on more than one card at a time. *Note: for help in creating your print sheets please revisit “Card Stash 103”. 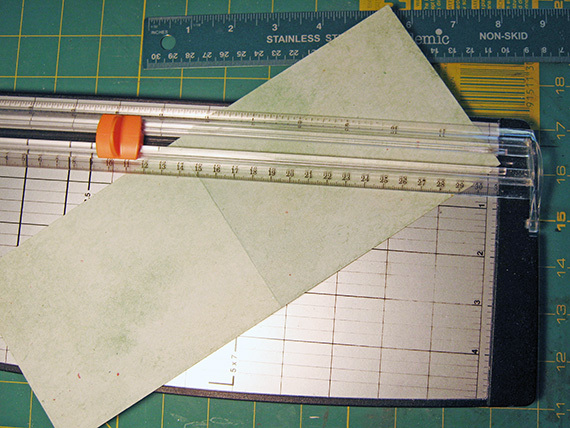 Step 4 – For card base, cut the 8.5 x 11 inch printed cardstock in half so you have 2 pieces measuring 4.25 x 11 inches. Score both pieces in half at 5.5 inches. On one piece of the 4.25 x 11, cut on the diagonal from the center fold to the RIGHT lower corner. On the second half, cut on the diagonal from the center fold to the LEFT lower corner. Step 5 – Adhere the front and back of the 4.25 x 5.5 rectangles together so you have one unit with your triangle cuts on the outer edge like this example. 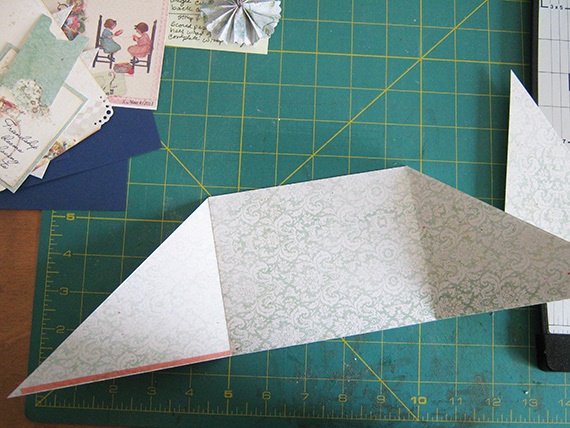 Add a thin adhesive to the bottom of the left triangle, fold over to front and adhere. 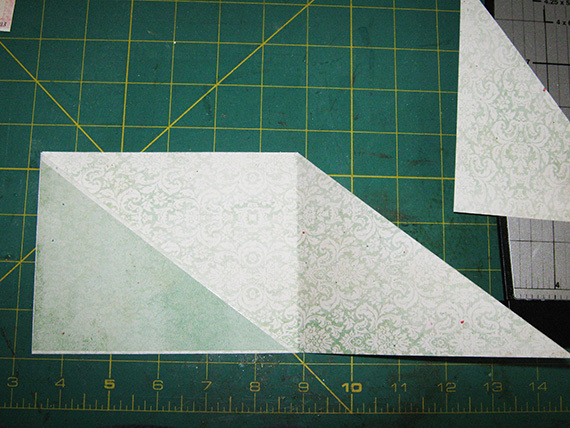 Step 6 – From your second sheet of background cardstock, cut two 4 x 5.25 rectangles, then cut them in half diagonally. This is your matting. Glue your matting to the left front triangle. 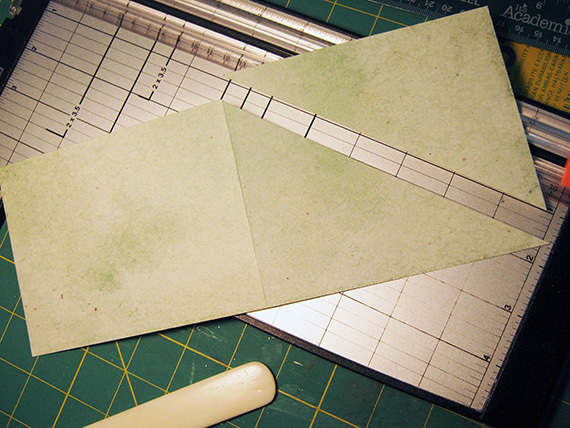 Step 7 – Run adhesive along the bottom of the right triangle, fold and adhere on top. Place matting on this right side. 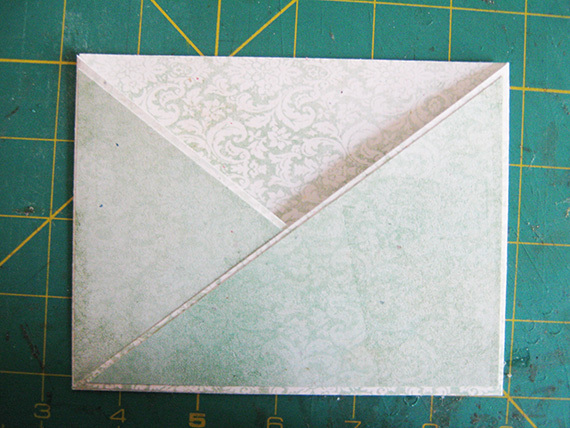 Step 8 – Cut the inside sentiment card. Use corner punches, or decorate however you like. I added a file tab so the recipient would know to pull out the inside sentiment card. 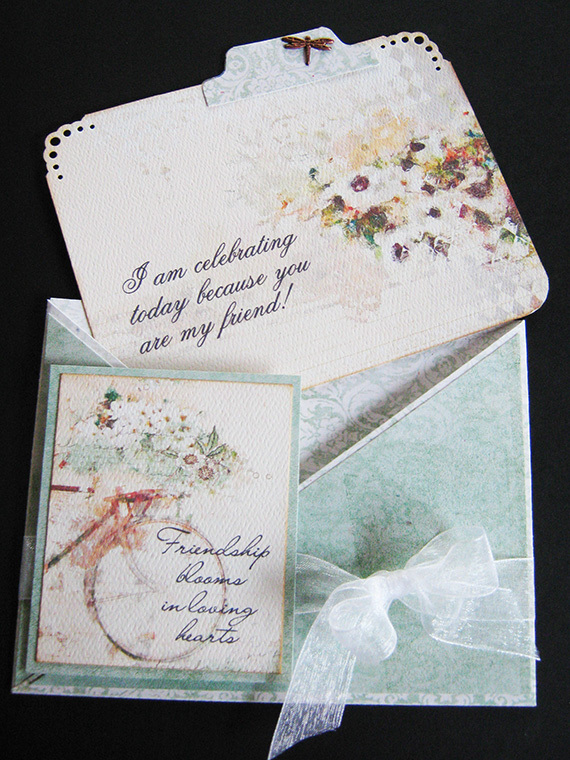 Step 9 – Cut and matt the outside sentiment card and adhere onto the card base using dimensionals. Be careful when placing the outside sentiment that you keep dimensional adhesives on the card base so it won’t interfere with sliding the inside sentiment card in and out of the base. 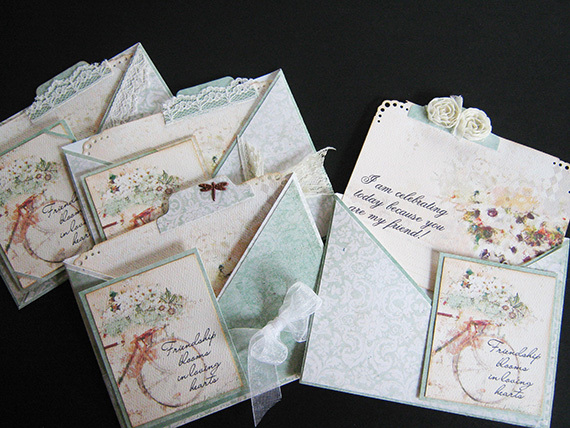 Use ribbons, brads, lace, flowers, or whatever your creative mind can think up to embellish your card.